Many bees are commercially valuable and an important part of our ecosystem, but in the wrong place at the wrong time, wasps and bees can become a serious pest. If you think you may have a bee infestation, Ashcraft Termite and Pest can help you first determine whether you’re actually dealing with wasps or bees. It is important to distinguish between the various wasps and bees because their potential as problems and their control differ. 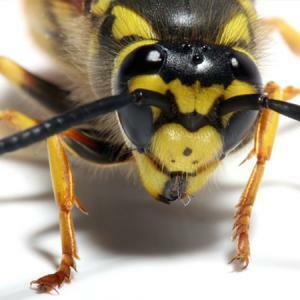 Occassional encounters with bees, wasps and hornets are inevitable and stinging insects are beneficial, but they can be a problem when they choose a nest site too close to your home. Most “problem” insects are social rather than solitary. This means that large numbers work and live together in the same nest. The nests may be built in or around human dwellings, making frequent encounters more likely. A person’s proximity to the nest also increases their chance of being attacked by multiple individuals. Even solitary-nesting insects can be a nuisance. For example, carpentar bees tunnel into wood structures, and cicada killer wasps excavate burrows in the lawn. Nest removal and methods of treatment vary depending on the specific insect and location of the nest. If our experts determine that the insects are honey bees, they will refer you to a local beekeeper who will in many cases be able to remove and preserve the hive. The beekeepers do not charge for the hives removal. The bees are still gone, but their environmental benefits remain!